I have used the iron quite a bit, but I feel this version of the paste method is superior for young calves. I was always afraid to use dehorning paste, because of fear of it ending up somewhere other than the horn buds, but this system really works. This method is for little calves; five to ten days of age is best, (but probably up to 3 1/2 weeks for bulls and 5 weeks for heifers.) 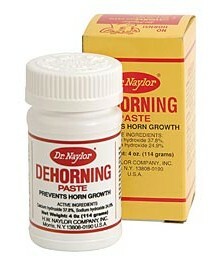 Dr. Naylor’s dehorning paste is six dollars at Jeffers Livestock. Cut the hair that is growing out of the horn bud, but leaving the hair that is growing outside the footprint of the bud. Put a SMALL dab (pea-size) of the paste on each side, and place a single piece of duct tape over both horns, over the head, (like an Alice-In-Wonderland headband). The uncut hair around the bud will keep the paste in the right spot. Do not squish the paste in after you put the tape on the head. After the tape is on the calf’s head, put the calf back with Mom. He will not rub it into his eyes, and he will not rub it on Mom. If he’s young enough, he’ll think he was born with it and will leave it on for a month! The tape needs to stay on for a least a couple hours, so avoid doing it on rainy days, or lock the cow/calf in the barn for the day. Usually the tape will stay on for some time, and helps to protect the area from flies. If you are worried about a scab falling off somewhere, you can remove the tape yourself in two weeks and the scabs will be attached to the tape. The possibility of re-growth should be the major criterion for deciding what method to use. When re-growth occurs, its removal is often necessary, not only for esthetics, but, for some reason, re-growth likes to grow backward into the head. It may take five years for a dehorning scur to grow into the head, but our Dexters live a lot longer than that, unlike commercial steers. 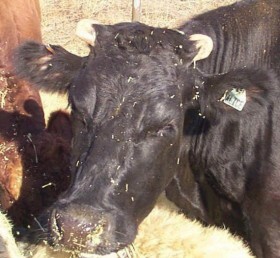 Novices (and even veterinarians) often botch iron dehorning and this results in re-growth. Or, breeders wait until they get a few calves together and call a vet. This means that at least some of the calves will be older and will need a more elaborate and painful dehorning, (usually cutting the bud off before burning the area). 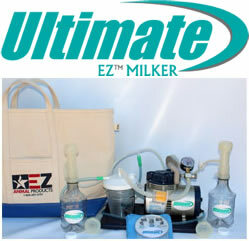 The scoop method is gruesome, and when used alone it very frequently results in re-growth. It also leaves the animal vulnerable to flies until it heals. Because the paste method is so easy, calves are dehorned in the proper time period, when it is most humane, and the incidence of re-growth in my herd has been zero. 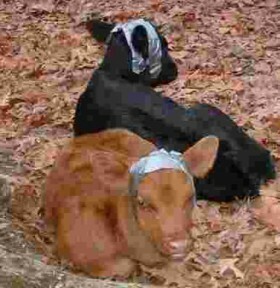 Dexter calves wearing their duct tape. Some people prefer to cut ear holes in the tape. 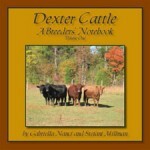 One calf is shown each way. Photo by Sally Schwuchow. This animal shows re-growth ("dehorning scurs") from improper dehorning with a disbudding iron. Fortunately, the re-growth is growing away from the head. I would like to ditribute these in Zimbabwe.